This past year, I have seen so many fascinating articles about honeybee artwork, that is art made with the effort of bees, not just art featuring bees in the design. I’d like to compile these articles here, and if there are any I’ve left out please share them! Aganetha Dyck has been giving bees sculptures to build their honeycomb on for years, but until recently, I didn’t have the pleasure of seeing her artwork. 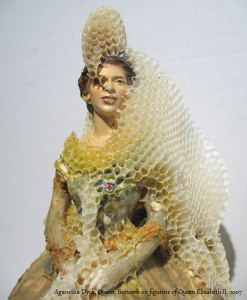 Some of this honeybee artwork is eerie, some of it old fashioned looking. It is so interesting to see where the bees build their comb up and other areas that are untouched. 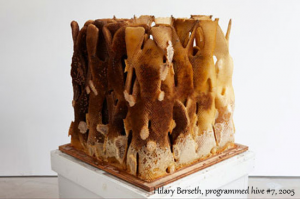 Hilary Berseth sets up the framework for her sculptures, and then lets the honeybees do their work. Honeybees are very precise workers, but even so, you cannot expect a certain outcome given the framework provided. It is also really neat to see the depth of color in the honeycomb. As honeycomb gets older, it turns from paper white to dark brown. I really love this example of honeybee artwork. 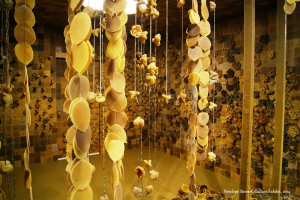 Penelope Stewart’s honeybee artwork invites you into a room completely made from beeswax. She sculpts the walls and decorates them with many intricate carvings. The carvings range from leaves and roses to less organic designs such as teacups and spoons. 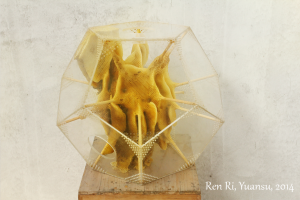 Ren Ri came out with art installations in China this year. He creates the framework, similar to Hilary Berseth, but focuses more on geometric honeycomb designs. The honeycomb can be manipulated by the bees into so many different shapes and sizes, with very little support from dowel rods. Each honeybee artwork design is encased in a plastic shape. 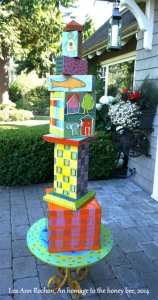 Lea Ann Rochon has been experimenting with colored beeswax as paint. Beeswax has been a type of paint for thousands of years and can stand the test of time. There are Egyptian paintings still today that used colored beeswax. I love the idea of artists using beeswax as a part of their honeybee artwork. 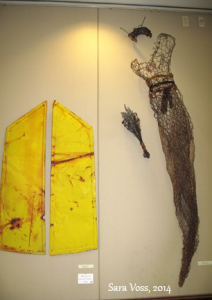 Santa Maria Public Library’s Shepard Hall hosted a found art exhibition all featuring honeybees. The goal was to spread awareness of the plight of honeybees and what people can do to help. There are many different honeybee artwork on display, and you can explore them all by visiting the website. 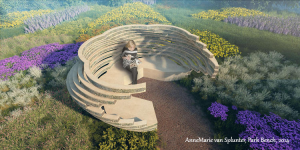 AnneMarie van Splunter designed a park bench for people to sit on and for bees to rest in. The goal is to make people and honeybees more comfortable around each other. We share many common spaces together, such as parks, and need to understand that we both have a place there. This honeybee artwork is both functional and beautiful. Can you hear the bees buzzing around this open field as you soak up the sun? There you have it! Honeybee artwork inspired and made by bees. These art displays are all across the globe, not just in the United States. It’s important for people worldwide to understand that honeybees impact us all as the most important pollinator (currently) for our food supply. Thank you so much to the artists who are helping to spread this message!